While the calendar may not say that summer is here, summer temps have already arrived in Georgia. As you prepare for the hot summer months, it is important to remember to drink water, wear your sunscreen, and take precautions to prevent summer damage to your home’s foundation. Summer’s intense heat places a tremendous amount of pressure and stress on a home’s foundation. Here in Georgia, our summers are hot and humid. While the heat itself is not the cause of damage, it is the drastic changes in humidity and moisture levels that put added stress on the foundation. The high heat in Georgia causes pop up thunderstorms and humidity in the air, while the high temperatures make the soil dry out very fast. It is this constant state of change that can put a home’s foundation under duress. A home’s foundation was designed to withstand a great amount of stress and pressure. Home builders and inspectors should be qualified to look for certain “red flags” while a home is being built to ensure that a home is properly constructed. However, seasonal soil expansion and contraction during the hot months of Georgia heat can cause the ground surrounding a home’s foundation to lose much of its structural integrity. It is important to know the early warning signs of summer foundation damage so that you can take proper means of correcting issues in a timely manner. Most foundational damage starts small: hairline cracks in walls, floors, and/or ceilings; water stains; windows and doors that stick. These signs should never be ignored! There are also signs to look for outside your home: if the ground around your home dries quickly after a heavy rain, then that water is draining away too quickly; however, if the ground around your home stays wet for a long time, then the water is not draining quickly enough. Both too little moisture and too much moisture are bad things when it comes to the foundational support of your home. The best way to prevent summer foundation damage to your home is to be aware of possible dangers and to act quickly if any occur. 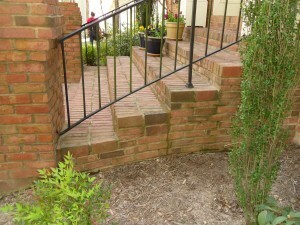 At Anglin’s Foundation & Masonry Repairs, we are the name to trust in Atlanta for all your foundational needs. With over 85 years in the business, we are the experts. Contact us today with any of your concerns.